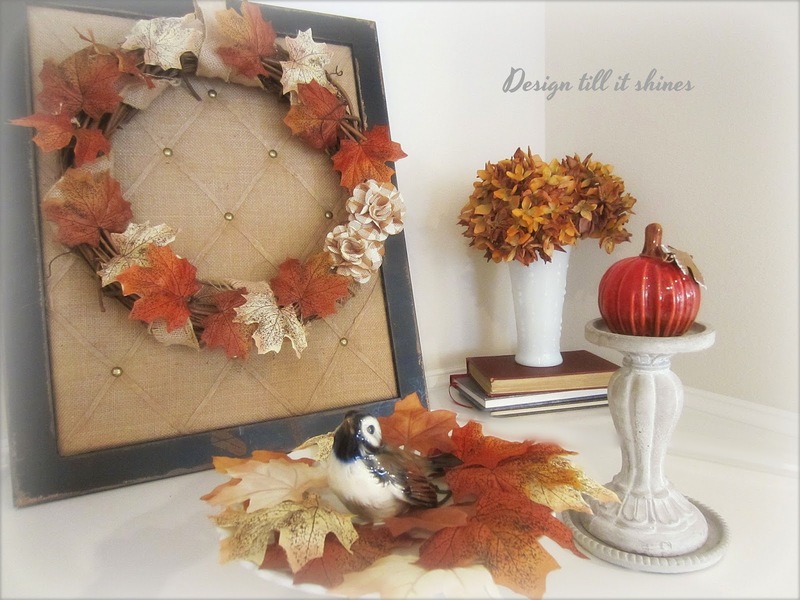 I've been admiring all the fall decor on blog land, so I wanted to join in with my some of my fall decor. 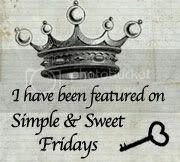 I always seem to write about the beauty of simplicity, but the reason is that is my style. I don't do a lot of decorating, just a few vignettes are all I need. I just want to get the feeling of the season and by creating little displays around my living and dining area I am able to accomplish that. I found this little Burpee's metal tray at my local thrift store for a few dollars.This is a reproduction of an 1898 metal tray and it reminded me of fall with all the warm gold and brown tones. 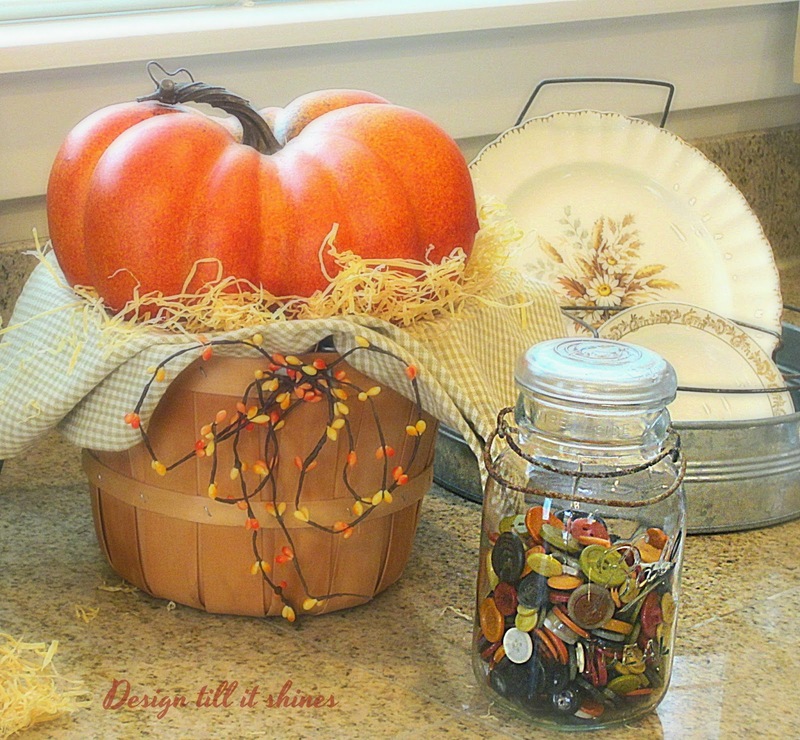 I love jars of buttons and I keep them out year round, so I added some fall colored buttons to my jar. 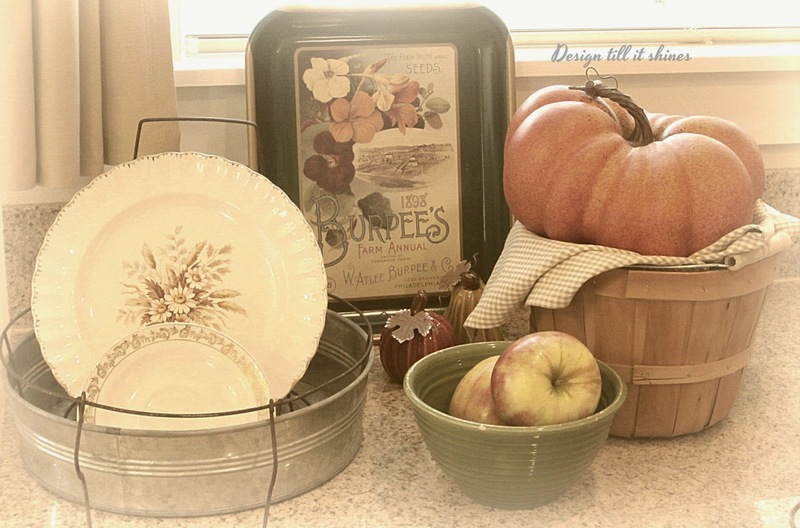 I already had my vintage green ribbed bowl and I found the little ceramic pear and apple/pumpkin at Michaels on sale. I found a small bushel basket that I bought last year, adding a pumpkin and a faux bittersweet bow for an accent. It's fun to see what you can put together using what you already have. Since we've had a lot of overcast skies lately, I added my decor to my kitchen counter by the window to bring in a bit more light. I really like the farmhouse theme reflected in this tray. Another simple look adding plates with a soft floral design and gold edging to my canning rack, they always remind me of farmhouse style. 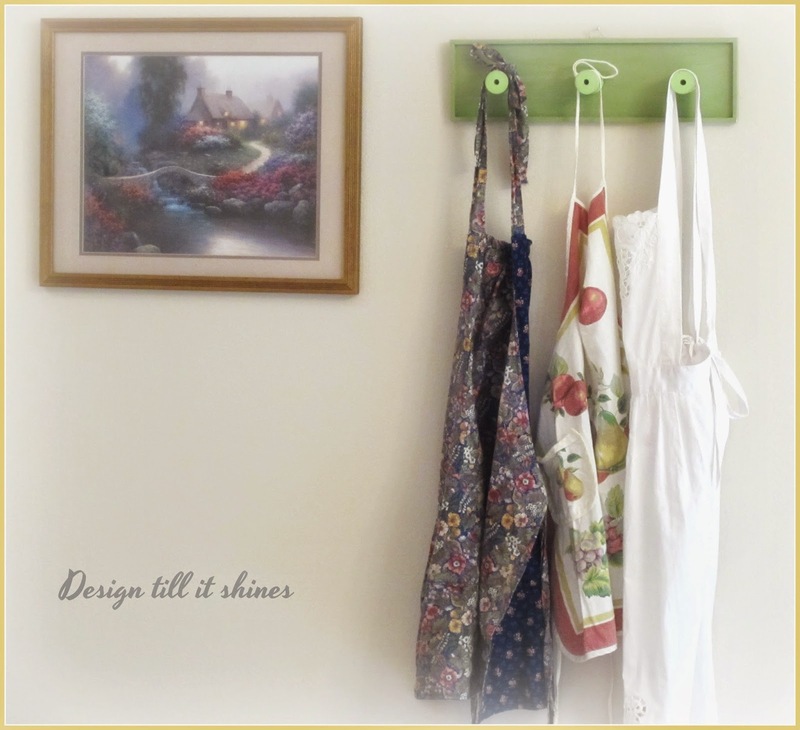 Vintage aprons have always been a favorite of mine, so I found another one that I added to my spool rack. I found this floral one with all the deep blues, golds and plum colors while thrifting of course, and I liked the fact that it was reversible too. Also, the apron shares some of the same colors that are in my cottage garden picture. I'll post more about this apron another time when I have a sunny day to take some pics. 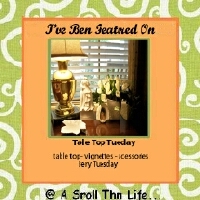 My mantel can be very frustrating to decorate since it is an open shadow box and the mantel has a very small ledge. Since I have to decorate inside of it, there are always shadows when I take my photos. It's located on the west side of our living room and gets little light. My camera has some limitations, even doing photo editing, so I do the best I can with this space. Our living area is small and I think you have to consider the scale of how things look in your photos, compared to how they look in person. I like somewhat minimalist decor and an understated look is best for this space. I decided to do soft fall colors to reflect off the white space of the open area. I don't like spending a lot for seasonal decor, since it's used such a short time and I am thrifty by nature, so I used my gray candlesticks and moved my little ceramic apple and pear over to help decorate my mantel. 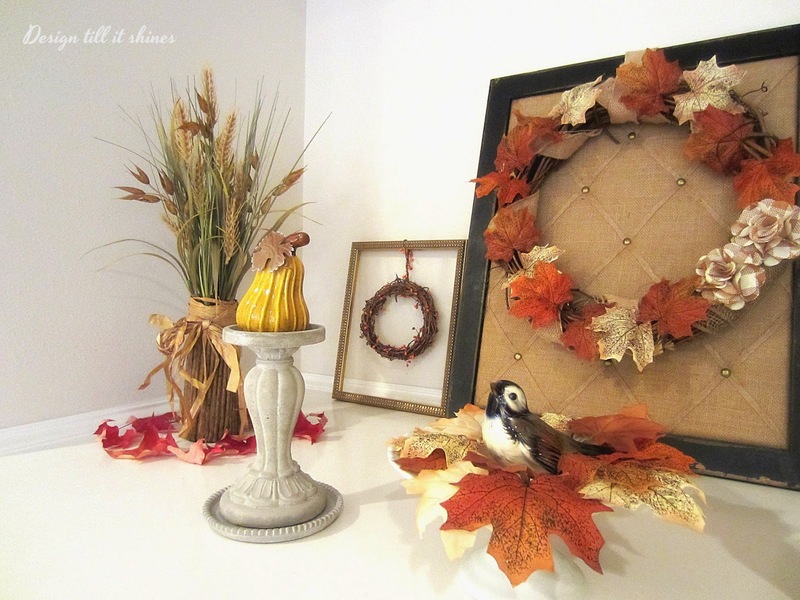 I added faux leaves to my wreath and since my bird statue reminds me of fall I added it to my pedestal. I didn't have any mini pumpkins that I liked to add to my candleholders, so the ceramic pear worked well with its golden color. I thought the ridged design really makes it stand out. I wanted to do something with my little gold picture frame and I added a mini wreath to it. I try and use what I already have and then shop for a few extra things if needed. The shaft of wheat made a nice addition with its golden color and texture. 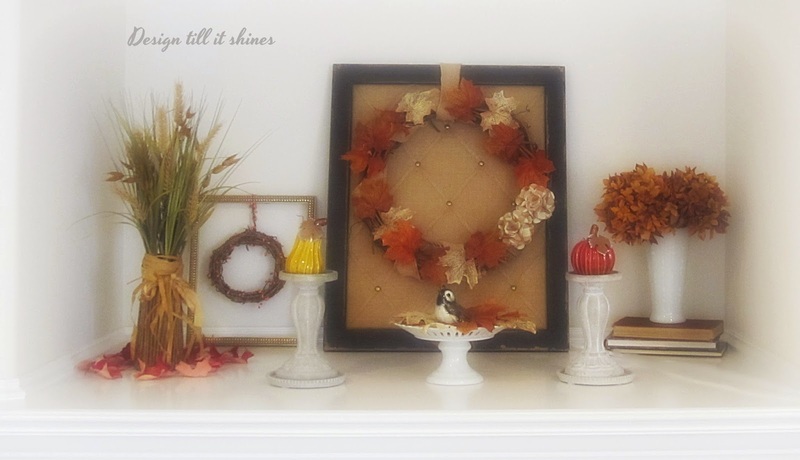 The pics came out a little darker than I wanted, but I was able to create a display of soft fall colors and white accents that really reflects my preference for a simpler style of decorating. The beautiful colors of Fall appeal to me more than any other season. I'll be sharing more in upcoming posts. Diane, I love the simplicity of your fall decor! The warm colors just pop against the light backgrounds. The special touches of those buttons in the vintage jar really add old fashioned charm. Love those aprons of yours too :) Have a wonderful day! 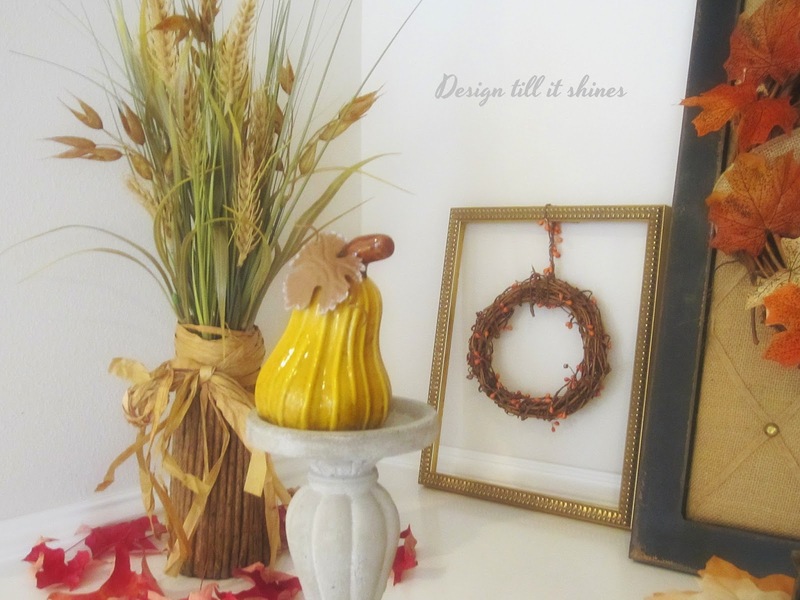 You've really put together some pretty Fall things in your vignettes. I like mixing old and new and the soft photo effect is beautiful, too! Happy Fall! 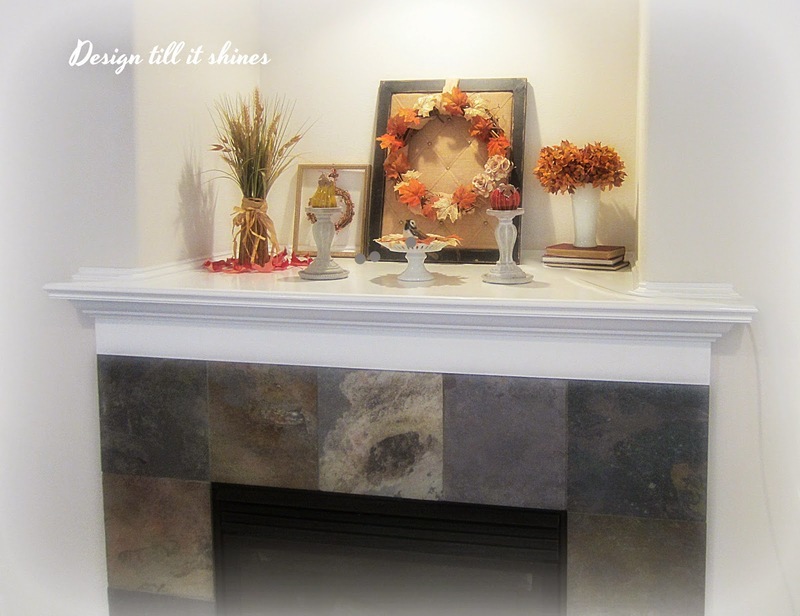 Your mantel and your kitchen vignette are so charming and festive. I'm a minimalist with my seasonal decorating, and I think you have just enough on your mantel to enjoy without overwhelming it. Great job! 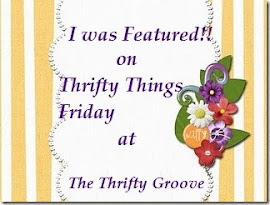 Thanks so much for sharing at Vintage Inspiration Party. Love how soft and sweet this vignette is. 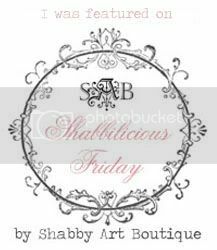 I have the graphic that is on your little tray -it's one of my favorites. I love all your fall decor. 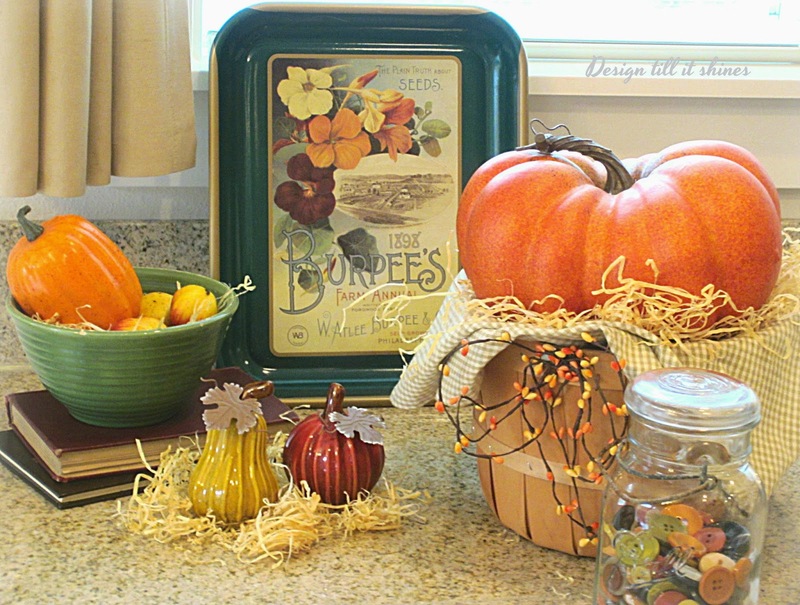 Isn't it funny how adding a few pumpkins and some straw makes the vignette just perfect! Both are beautiful Diane. I especially love the kitchen vignette! 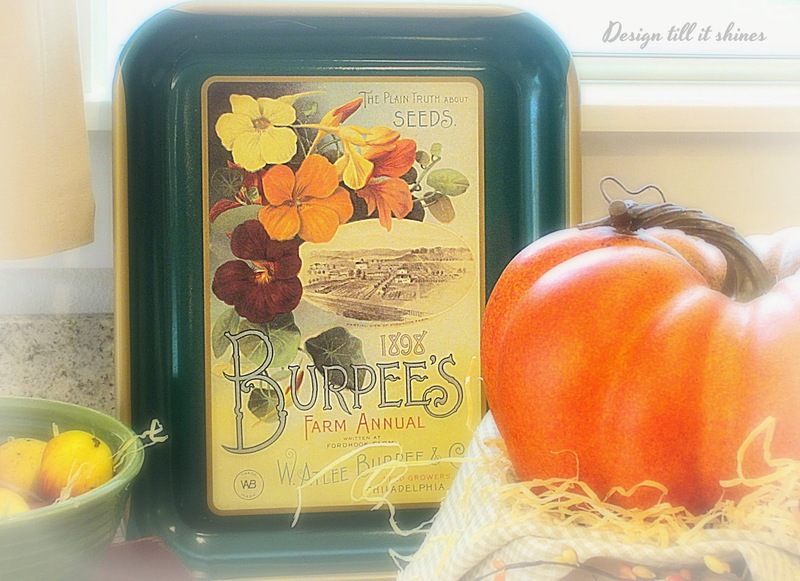 The plates in the canner are perfect and I love the Burpee tray. I am putting away Halloween and decorating for Thanksgiving. I used a trio of trays on my mantle. Thanks for sharing with SYC. Oh, what lovely vignettes around your home. 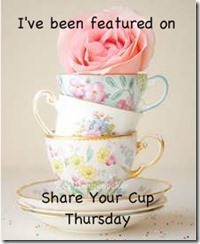 That is a sweet little tray and I would have snatched that up in a heartbeat! I like your mantel and I think you've done a beautiful job dressing it up for fall. Thanks so much for popping in to see me. How fun to think we were so close when we came down for my nephew's wedding! We stayed in Washougal and visited Camas Antiques, and I admired many of the same things you showed in your post below, like those vintage suitcases. They were just starting to switch out some of the Halloween decor for Christmas when we were there on Saturday morning. It's such a pretty little town. Your fall touches are lovely. Like you, I don't go whole hog in decorating for fall, a few touches here and there are all that's needed. Your vignette with the Burpee tray is wonderful. Thanks for coming by my blog and leaving a comment so I could find your blog! 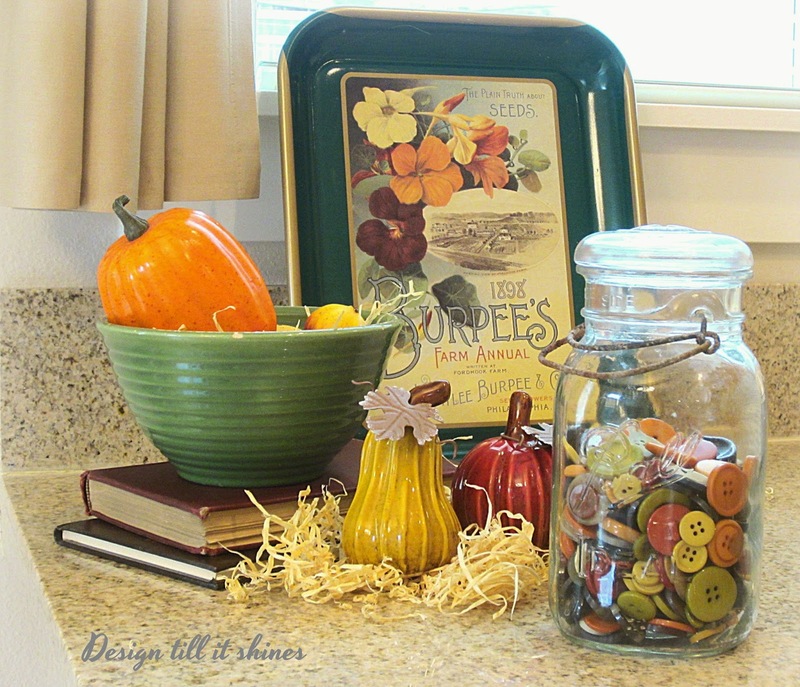 I love how the jar of buttons are in fall colors! Very nice. I too love all of your fall decor, it's just perfect for this time of year! The fall colors are just gorgeous! I like the little pops of warmth that they add. I bought those same little pieces at Michaels, aren't they adorable?! semana, e lindos dias de outono! I love fall colors! Your decor is lovely. Thanks for sharing! It all looks so festive for fall Diane. There's something so lovely about a simple jar of buttons, and I love vintage aprons too.